Baseline Shield contains a license activation technology for license management, which means you must activate your copy of Baseline Shield in order to authenticate its license. 1. After purchasing a Baseline Shield license, you will receive a Licensed Product ID from PC Undo. 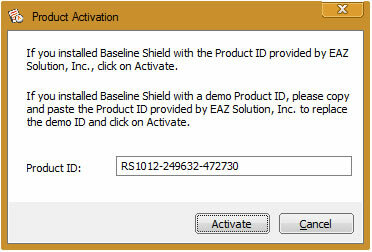 You can install Baseline Shield with this Licensed Product ID and the activation will be done automatically during setup. Or if you already have a demo version of Baseline Shield installed, you can activate the demo setup with the licensed Product ID without uninstall and reinstall the software. 2. To activate Baseline Shield demo setup with a Licensed Product ID, right click the Baseline Shield tray icon and select ABOUT from the popup menu. Click on Activate button on the ABOUT window. 3. Enter the Licensed Product ID provided by PC Undo into the text box and then click on the on Activate button. The computer needs to restart to activate the Baseline Shield pre-OS Recovery Console. Baseline Shield will be fully activated after the restart. You can only activate the number of computers authorized by the Licensed Product ID.